I'll attach a few of my favorites of Jewel all dressed up in her Western outfit. She's a cutie indeed and puts a touch of elegance and grace in her Western gaits. The lady who approved her for Light Horse Brigade recently said that it looks like if I slow her up just a bit, she'd be doing a piaffe because she has this pretty little elevation and suspension in her jog. Can you tell that I adore this filly?! 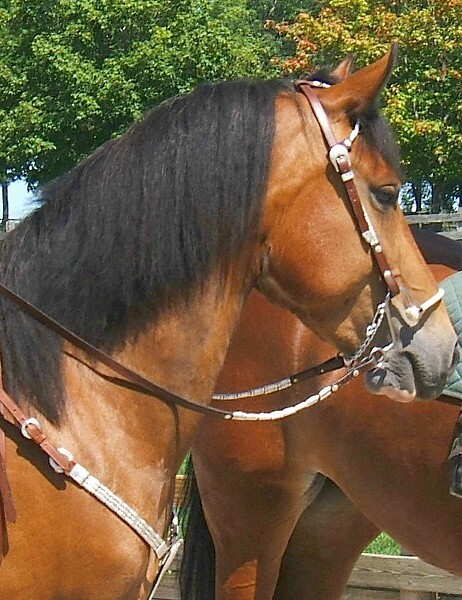 She was my last "sale filly" and I had planned on keeping her for myself because she stole my heart, but Greg begged me for a year to let him buy her and I finally gave in. I always tell him that I'll buy her back anyday. Getting to know Jewel's mother and father and having Heather let me ride her sister, Rijcke (who looks almost identical to Jewel) makes me feel even that much more connected to her. It's bittersweet watching her grow up because I think it'll be several years before another baby grows up in my barn. boo hoo! 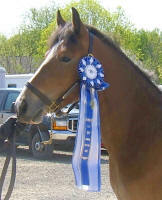 The neck ribbon that Jewel is wearing is her year end Top Ten Halter award from Flying W Farms! The BIG blue and white ribbon is, of course, the Flying W Farms High Point Award. 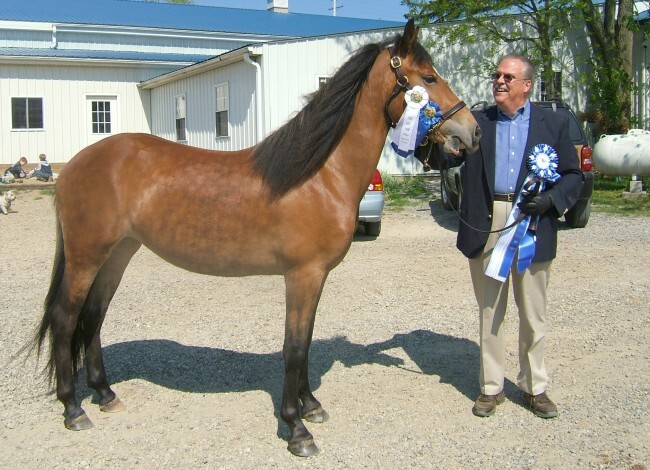 Any other ribbons you see her with in the pictures were won in halter classes. At the Blue Lakes show, she won her halter class and qualified for the championship class which was really fun. 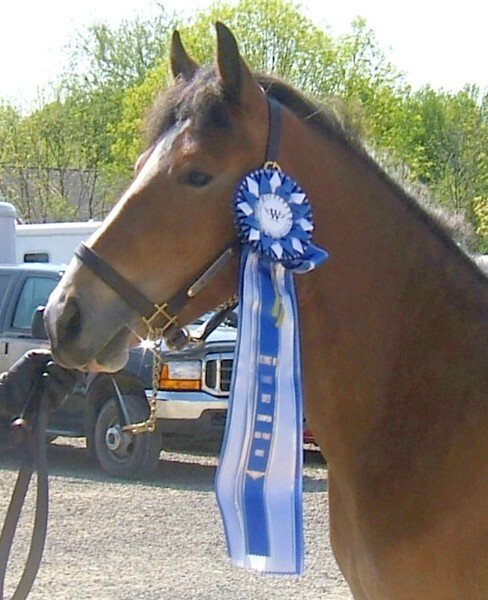 That's when they awarded her the Flying W Farms High Point award which was MUCH more gorgeous than any other ribbon given out at the show that day! 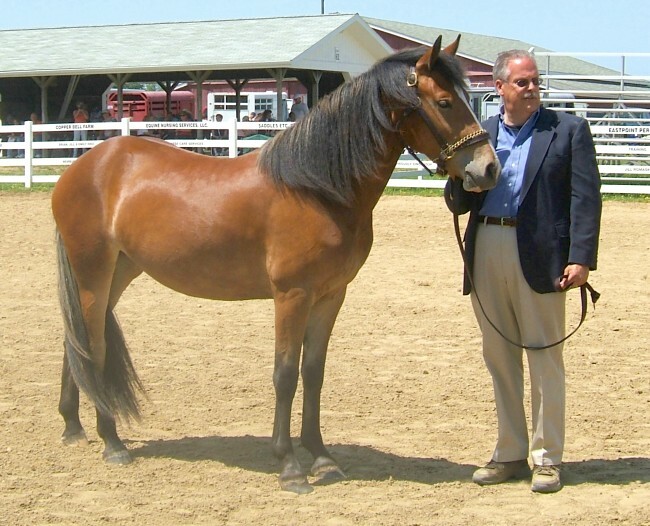 Greg's love of horses didn't develop until he was in his early 50s. 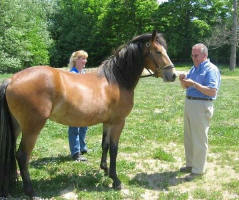 He took riding lessons at a nearby lesson barn together with his daughter, Callie, who was in her late 20's at the time. Greg also has a one year old grandson named Dylan and an adorable 4 year old granddaughter named Taylor who began riding at only 3 years old! What a rider she'll be if she continues to stick with it! 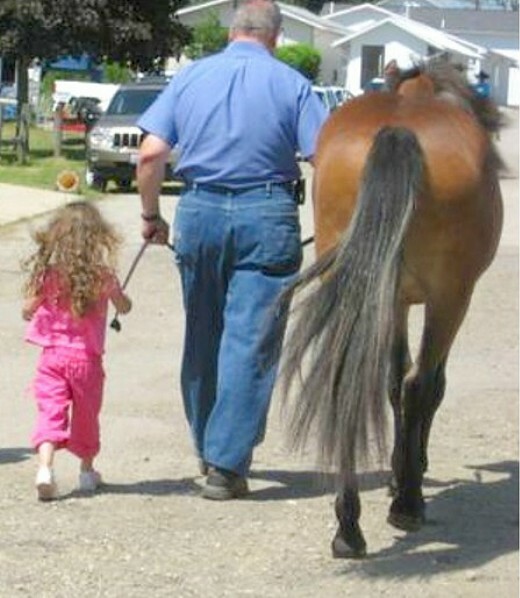 In 2005, he saw my ad for Jewel on the internet and he and Callie came out to see her. Jewel was just a little thing, only a few months old back then. 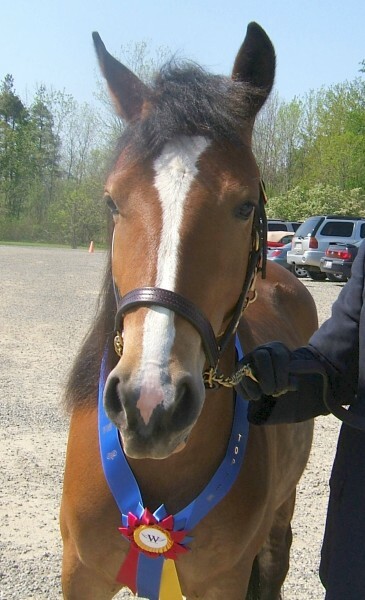 He met my Tiara and only a few months later began a half lease on her, riding her at a nearby boarding stable and out on trails and that's when he really became hooked on the Flying W Farms horses! 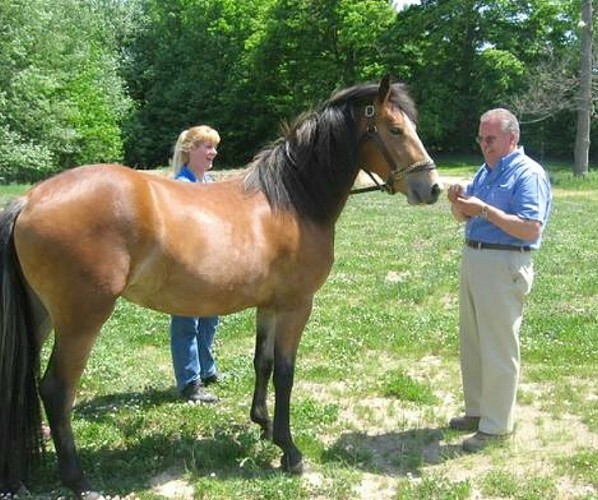 Greg ended up buying Jewel as a yearling in 2006 and looked forward to the whole experience of raising his own Flying W Farms baby with my help. 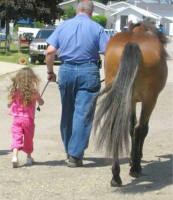 Last year, he rode my Tia on the trails as I handwalked Jewel in several of our nearby parks. Jewel was fantastic on the trails from day one and even enjoys being the lead horse. 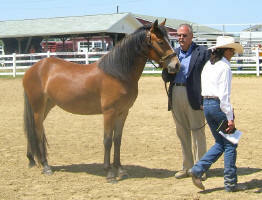 I showed her in several halter classes at local shows to get her experienced in the show ring as a yearling. 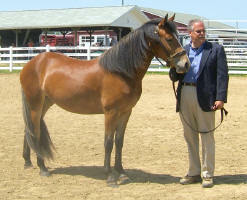 This year, Greg is showing Jewel in halter classes himself and is doing really well. Jewel handles showing like it's just another day in the park. Greg's wife, Linda, often accompanies us along with his daughter, Callie, and granddaughter, Taylor. Needless to say, they have quite the cheering section. Greg is thoroughly enjoying the experience of raising his filly and now looks forward to each and every one of her training sessions, videotaping several of them. I just started official training with Jewel about a month ago. I'm very impressed with her obedience, work ethic and long attention span for just a 2 year old. She accepts everything very willingly and is always eager to please. So far, she has been ponied at the walk and trot alongside my Tiara, she lunges beautifully at all three gaits and is very responsive to voice commands. I have lunged her in a bridle, surcingle and sidereins and also in a saddle which she easily accepted. I just began working her in long lines to teach her what the reins mean and I'm also line driving her in preparation for teaching her to drive. She's a lovely, level headed filly, an absolute joy to work with and we all can't wait for the day that she becomes a mature, fully rideable, driveable horse!